Sounding modern and urban in this context, the Illuminati Series are partially lathed, partially polished on top for great looks on stage to go with the refined sound. Due to their weight distribution, these cymbals sound lower and fuller than their weight suggests, yet offer a pronounced high pitch punch. Made for rock and metal, the fast attack of the crashes and the penetrating ping of the rides easily cut through layers of amplified guitars. 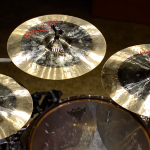 The ride cymbals come equipped with a monster-sized bell by default.